Prehistoric Japan is divided into four major cultures: Palaeolithic, Jomon, Yayoi and Kofun. Each of these major cultures, or periods, is further subdivided into several sub-periods. The cultural phases are almost limitless. The dates for these periods are given in uncalibrated radiocarbon years before present, except for the beginning of the Palaeolithic, which is based on other dating methods and dates from 50,000 years ago to the start of the Jomon Period. It is a period generally thought to be dominated by big-game hunters, although there is little direct evidence for how these people lived. Everyone agrees that there is a Late Palaeolithic in Japan, which dates from about 35,000 years ago to the advent of pottery technology 13,000 to 10,000 years ago. The evidence for humans in Japan before 35,000 years ago is quite controversial. The earliest inhabitants of the Japanese islands were hunter-gatherers, with the long coasts providing good supplies of fish. Pottery was made, after which the period is named. These hunter-gatherers seem to have arrived before the end of the last ice age, via land bridges that joined Japan to Asia's mainland. They successfully fended off invaders until about 300-200 BC, but still contributed greatly to the genetic make-up of modern Japanese people. Rice culture was imported into Japan around 200-100 BC by farmers who migrated from the Korean peninsula, although some experts believe the influx may have begun up to seven hundred years earlier. These newcomers also introduced the language from which all modern dialects of Japanese appear to descend, replacing any language possessed by the earlier populations of hunter-gatherers (see the Legendary Period, below, for a more detailed examination of Japanese language origins). With the introduction of agriculture, social classes started to evolve, and parts of the country began to unite under powerful land owners. Chinese travellers during the Han and Wei dynasties reported that a queen called Himiko (or Pimiku) reigned over Japan at this time. The Yayoi Period also witnessed the introduction of iron and other modern ideas from Korea into Japan. As with the preceding period, it is Yayoi pottery that gives the period its name. According to legend, Emperor Jimmu Tenno arrived with his people on the islands of Japan in 660 BC. However, the number of his successors between that arrival and the first truly historical emperors puts that arrival at some time in the first century, coinciding with the Yayoi Period, and all dates prior to AD 500 should be approached with caution. The dates for the first twenty-eight emperors are based on the Japanese calendar system. Today there are around 127 million Japanese speakers worldwide, with a vocabulary that has been strongly influenced by Chinese during the fifteen hundred years between the legendary period and the modern day. It is an agglutinative language with a complex system of formalities that express the hierarchical relationships within Japanese society and the relative relationships between internal discussion partners. Japanese script is a mixture of Kanji - characters copied from Chinese - and Hiragana and Katakana, which are based on syllables. It is one of two languages in the Japanese Ryukyuan language family - the other being Ryukyuan, which is spoken on the Ryukyu Islands. Experts remain unsure about the origins of this language family. It shows links and similarities with other languages in many different areas, with many theories being expounded about its source, these including the following: Japanese is related to a now-extinct language which used to be spoken in Korea and Manchuria; Japanese is related to Korean; Japanese is one of the Altaic languages which followers of this theory also believe to include Mongolian, Tungusic, Turkic, and Korean; Japanese is a Creole language, possibly with Austronesian influences; Japanese is a purely Austronesian language; Japanese is related to Tamil. Tribal leader. Legendary date for his arrival is 660 BC. A central power had certainly developed in the fertile Kinai Plain in Japan by the Kofun Period (kofun after the type of tombs which were built for the country's rulers). By about 400 the country was unified as Yamato Japan, with the royal court in the Yamato Province (modern Nara Prefecture). Yamato Japan extended from Kyushu to the Kinai Plain, but did not yet include the Kanto, Tohoku and Hokkaido. Still part of the Legendary Period, dates for the emperors of this period are less uncertain but still not entirely trustworthy. Japanese did not have its own script before the fifth century. After the Japanese had become acquainted with Chinese culture via Korean monks and scholars, they adopted Chinese script in addition to other Chinese cultural aspects. Their own Japanese script was developed from this over the course of time. Chinese characters were used to write Chinese loan words or Japanese words with the same meaning. Word endings and expressions with a grammatical function were also written in this Kanji script until the development of two writing systems, Hiragana and Katakana, which were based on syllables, replaced it. Commonly known as the tomb of Emperor Nintoku, the keyhole-shaped creation is one of the three largest tombs in the world. Although clearly dedicated someone of immense power, there is no proof that it actually is built for Nintoku, so archaeologists generally know it as Daisenryo or Daisenryo Kofun. The tomb is surrounded by three moats, and construction takes sixteen years. Possible founder of a new dynasty. The Asuka Period witnessed the continuance of friendly relations with the kingdom of Paekche which helped the arrival of Buddhism in Japan (in 538 or 552), and the flourishing of the imperial court which promoted the new religion. From this point onwards, emperors follow traditional dates which are more or less reliable. Earliest emperor with verifiable dates. There is a succession war in Japan. Regent to Suiko. Promoted Chinese ideas. Abdicated in favour of her brother. The era of the Fujiwara Clan starts and lasts until the rise of the samurai military class in the eleventh century. A new government and administrative system is established after the Chinese model in the Taika reforms. All land is bought by the state and redistributed equally among farmers in a large land reform in order to introduce the new tax system that is adopted from China. Empress Kogyoku re-acceded throne as Saimei. In AD 710, the first permanent Japanese capital was established in Nara. This was a city modelled on the Tang Chinese capital of Xi'an, which was at its peak in terms of cultural influence and industrial power. China was the superpower of the ancient east, and everyone wanted to copy its glories. The imperial court made a concerted effort in this period to document its history, producing the country's first works of literature. Abdicated in favour of cousin. Buddhist. Second cousin. A young sovereign. Posthumously named Junnin. Empress Koken took crown back from Junnin and ruled again. Confucianism and other Chinese influences were at their height during this period, and the imperial court was similarly at its height. The period began in 794 with the capital being moved to Heian kyō (modern Kyoto). The first shoguns appeared during this period, but only as generals leading campaigns against northern 'barbarians'. 50th Emperor of the Sun Line. The presence of salt pans around the Seto Inland Sea in the eighth century is supported by documents. Nihon Koki, for example, has an entry dated 14 November 799 which relates that 'Bizen Province said, "People in Kojima County have made their living by producing salt, and prepared for Cho and Yo taxes with the salt. The mountains, the wilds, the seashores, and the islands there have been for common use as a rule. Powerful clans and families have come to disturb and deprive the people. The more prosperous the powerful become, the more distressed the poor turn. We beg things to be replaced." The Emperor ordered, "It is against the public benefit that the powerful intimidate the poor. It must be stopped and never be allowed to happen."'. Shirakawa becomes the first cloistered emperor when he 'retires' to a monastery in 1086, but in fact continues to exert considerable influence over his successor (all cloistered emperors below are shown in red, while their 'influenced' successors are shown with a shaded background). Brother. Died aged 17 with no heir. Brother. Cloistered emperor (1158-1179 & 1180-1192). Go-Shirakawa attempts to regain direct power, but fails, so he reverts to cloistered rule. The Taira and Minamoto clans fight a deciding war for supremacy, the Gempei War. In 1185, the Battle of Dan-no-ura sees the Taira Clan being overthrown by the Minamoto, who in 1192 become the first shoguns to govern the country. Cloistered emperor (1198-1221). Died 1239. After Shogun Yoritomo's death, quarrels for supremacy start between the bakufu of Kamakura and the imperial court in Kyoto. Emperors of this period follow traditional dates which are more or less reliable. The Shoguns became the secular rulers of the country from 1192, while the Hojo Regents gained imperial power from 1203, depriving the emperor and government offices of practically all remaining power. The Hojo Regents gain power In Japan. Sent into exile after being defeated. Died 1242. The quarrels for supremacy between the shoguns and the imperial court reach an end in the Jokyu War (or Incident) when the imperial army is defeated in Kyoto, and the Hojo Regents in Kamakura achieve complete control over Japan. Died 1234. Dethroned aged 2. Officially listed after 1870. The first Mongol invasion is defeated through bad weather conditions, with the outnumbered Japanese facing superior and much more modern forces. The defeat is an unexpected one for the otherwise near-universally victorious Mongols. The second Mongol invasion is again defeated through bad weather conditions. The Mongols suffer around seventy-five per cent casualties and a clear limit is set on their expansion in Asia. Japan praises the kamikaze, or 'divine wind', which has saved it twice from invasion. At the climax of a two-year-long campaign, Go-Daigo overthrows the weakened Hojo Regents. Ashikaga Takauji drives Go-Daigo out of Kyoto and two years later declares himself shogun, splitting the country between the Northern and Southern courts. The Hojo Regents were defeated by the imperial court, but almost immediately the Ashikaga Shoguns seized power and held the stronger north of Japan from Kyoto. The Ashikaga Shoguns rule in the north until the Japanese imperial court is reunited. These emperors ruled in the southern court only, in effect from 1336 but officially from 1338, when Ashikaga Takauji declared himself Shogun. In 1392 the southern court gave in and the country was reunified. Ruled all of Japan until 1336. The Japanese imperial court is reunited when the southern court surrenders to the north. The Muromachi Period emperors were dominated by the Ashikaga Shoguns. The period ended when the last Ashikaga shogun was driven out of the capital in Kyoto by Oba Nobunaga. 100th Emperor of the Sun Line. Died 1433. The Sengoku Period, the age of civil war, begins in Japan. 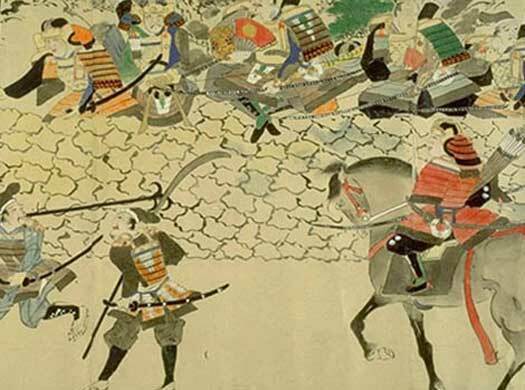 Some Japanese scholars are well aware of China's 'Warring States' period in the fifth to third centuries BC, and use the same term to cover this very similar period in Japanese history. Although Venice's Marco Polo had known of the country's existence from his travels, the Portuguese now 'discover' Japan by accident, despite having sailed up and down the coast of China for the last thirty years. The accident is due to stormy weather blowing a vessel off course in September 1543, although perhaps the Ryukyu Islands are first explored by Portuguese in 1542. The first visit to Japan by a European seems to take place towards the end of 1544 (or early in 1545, since the country is reported to be a cold place), but the report that reaches Spanish ears is based on a mixture of hearsay and fairly accurate fact. Within seven years the Portuguese establish a trading base at Nagasaki. The Ashikaga shogunate is ended when Yoshiaki is driven out of the capital in Kyoto by Oba Nobunaga. During this period the Portuguese and Spanish began to make themselves at home in Nagasaki and a few other ports. The Japanese were appalled by the stinking, unwashed sea-dogs who manned these European carracks. One rather sniffy scribe doubted any existence of ceremonial etiquette amongst them, while complaining that they showed their feelings without any self-control. If they had not arrived with muskets to sell then they may not have been given such a welcome reception. These merchants were soon followed by Jesuit missionaries who hoped to convert the country to follow the church in Rome (whilst hiding the fact that Europe was riven by schism). The arrival in 1600 of a Dutch trader changed everything. Oda Nobunaga dies, and Toyotomi Hideyoshi soon cements his place as successor, the most powerful daimyo in Japan. Japan attempts to invade Korea twice but is defeated both times. Toyotomi Hideyoshi dies on 18 September 1598, and the Council of Five Elders keeps it a secret until they can withdraw the army from Korea. The dream of invading China is over, and Toyotomi's son, the infant Toyotomi Hideyori now faces the threat posed by the powerful Tokugawa Ieyasu. The council fulfils the role of regency for Hideyori, hoping to hold the peace until the child can come of age. On 21 October 1600 the Battle of Sekigahara witnesses a mighty clash between more than 200,000 warlords, samurai, and retainers. The mighty 'Western Army' is loyal to an infant ruler-in-waiting named Toyotomi Hideyori. The rival 'Eastern Army' is under the command of Tokugawa Ieyasu, who hopes to seize power. His forces are outnumbered by almost two-to-one and it seems inconceivable that they can defeat the stronger army. However, Ieyasu is a shrewd operator. At a critical point in the battle, General Kobayakawa and his 16,000 crack troops switch sides to join Ieyasu. Four other general do the same, all thanks to pre-arrangements with Ieyasu. The Western Army is suddenly outnumbered, and badly off-balance. Its ranks break and scatter, and Toyotomi Hideyori is captured and married off to Ieyasu's grand-daughter, bringing him firmly under control. Ieyasu's victory ushers in the Togugawa Period, with Ieyasu himself in the role of its first Shogun. The Edo Period is also known as the Tokugawa Period, as the imperial court was dominated by the powerful Tokugawa shoguns. Japan's various daimyo (feudal lords) had been fighting amongst themselves for several centuries, with several extremely powerful warlords effectively dividing Japan into rival factions during the sixteenth century. Tokugawa Ieyasu was the main beneficiary of the achievements of Oda Nobunaga and Toyotomi Hideyoshi, but his military and strategic brilliance ended the opposition of any rival warlords at the Battle of Sekigahara. Under his governance Japan experienced relative peace for the next two and-a-half centuries. The capital was now at Edo (modern Tokyo). The arrival of Pilot William Adams and the Dutch ship, the Liefde, in 1600 transformed the status of foreigners in Japan. Shogun Ieyasu now encouraged both the Dutch East India Company and its English counterpart to establish trading bases. The first English ship to arrive, in 1613, was the Clove. By this time William Adams had been living in the country for thirteen years and, having the ear of the shogun, was able to act as a facilitator and translator. It was not to last, however. Ieyasu may have welcomed traders, but his son was xenophobic and vehemently anti-Christian. A wave of draconian edicts persecuted Christians and merchants alike and soon forced them to leave the country entirely. The last English vessel in Japan sets sail in December 1623, taking with it the handful of other traders who have weathered the storm unleashed by Shogun Hidetada. The country enters a period known as sakoku - the closed country. It has seen enough of the troublesome foreign barbarians and their bitter internecine wars. Now, after almost a century of contact, it closes its doors to the world. For some time, no US ship has been allowed to put in at Japanese ports, and shipwrecked American sailors are regularly dispatched to prevent them from polluting the isolated Japanese culture. Commodore Matthew Perry arrives with a fleet of ships on 8 July and forces Japan to end its period of isolation. This act leads shortly to the ending of the Shogunate. Following the treaty entered into between Commodore Perry and the Shogun in 1853, the first US consul general, Townsend Harris, arrives on Japanese soil to take up his office. Initially, the Japanese refuse to recognise his official status, treating him as a private citizen and a barely-honoured guest. After eighteen months of protracted negotiations and a personal audience with the Shogun, he is able to open the first US Consulate in Shimoda under the terms of the 'Harris Treaty' (as described with a certain level of accuracy by the John Wayne feature film, The Barbarian and the Geisha, 1958). The Shogun resigns. While being part of a movement which had aimed to reform the aging shogunate, Shogun Yoshinobu is ultimately unsuccessful. The Modern Period begins in Japan. With the Pacific Ocean at its back, the chain of islands that make up modern Japan reach from the Sea of Okhotsk in the north to the East China Sea in the south. In the north Oriental Russia is not only Japan's neighbour across the Sea of Japan to the west, it also occupies the northernmost islands off the coast of Hokkaido (Hokkaidō), part of the Kuril Islands chain that was annexed by Russia at the end of the Second World War. Much of the rest of Japan faces North Korea and South Korea, while the southernmost edge of the country's territory abuts that of China to the south-west. Four main islands make up the country, these being from north to south Hokkaido, Honshu (Honshū - the largest of all of them), Shikoku (the smallest), and Kyushu (Kyūshū). A further six thousand smaller islands are also included, although less than five hundred of these are occupied. The resignation of the last Shogun in 1867 and the death of Emperor Komei in the same year ushered in a new era for Japan. Komei's successor, Mutsuhito, was able to ensure the formal restoration of imperial rule on 4 January 1868, ending 265 years of governance by the Tokugawa shogunate. The USA had already enforced the end of Japan's self-imposed isolation in 1853. Now it would be a key source of cultural influence over Japan, although perhaps not especially so until after the end of the Second World War. Strictly speaking, the modern period in Japan consists of several eras: the Meiji era (1868-1912), which saw Japan transform into a modern industrial nation; the Taisho era and Early Showa Period (1912-1945), which saw Japan extend its power over much of republican China and the Pacific; and finally the Post-War Period. Era names are selected to accompany each emperor during his reign, and subsequent emperors also have names for their eras. The term for the era which began in 2019 is made up of the two characters, 'rei' and 'wa', meaning 'order', and 'peace' or 'harmony'. For the first time the era name was taken from an old anthology of Japanese poems, the Manyoshu, instead of having a Chinese source. Japanese emperors are more often known by their personal names even after death than those which they are given upon their deaths, so official names are shown here in parenthesis where available. Inside Japan itself, such use of personal names would be considered impolite. Formality and respect remain mainstays of Japanese culture and behaviour even with the often impolite influences of the rest of the modern world. Son of Komei of the Edo period. Meiji era. With the promulgation of the Meiji Constitution (the informal name for the 'Constitution of the Empire of Japan'), a prime minister is selected to head a constitutional monarchy in Japan. It is hoped that the constitution will define Japan as a capable, modern nation which is deserving of Western respect whilst preserving Japan's own power. The emperor is granted supreme control of the army and navy. With the Qin rapidly losing the age-old Chinese influence over Korea to a newly-resurgent Japan, tensions are high. A decade of peace between the two regarding Korea comes to an end when the pro-Japanese Korean leader of the 1884 coup, Kim Ok-kyun, is lured to Shanghai and is assassinated. Japanese public opinion is outraged by the subsequent treatment of his body. The peasant-led Tonghak Uprising breaks out in Korea in the same year, and Chinese attempts to reinforce the Korean king are met with military opposition by Japan. The First Sino-Japanese War is triggered. Japan's modern military forces entirely outmatch the more numerous but outdated forces of China. By March 1895 the Japanese have successfully invaded Shandong Province and Manchuria and have fortified posts that command the sea approaches to Beijing. China sues for peace. In the Treaty of Shimonoseki China recognises the independence of Korea and cedes to Japan the island of Taiwan, the adjoining Pescadores, and the Liaodong Peninsula in Manchuria. Japan occupies large areas of Korea during the Russo-Japanese War, with the result that a protectorate is formed to oversee these areas. Japanese resident-generals are appointed to 'manage' the country with the Korean emperor remaining in charge in name only. Following several years of increasing dominance in Korea which is tacitly supported by the Western nations, the former Korean empire is annexed to Japan. The emperor is removed and governors-general replace him in running the country. Son. Taishō era. Died following heart attack. With the First World War already underway in Europe, Japan declares war on Germany on 23 August 1914. The principle motive is to take advantage of Europe's confusion - especially Germany's - to expand its own sphere of influence in China and the Pacific. Allied with Britain which has its own need to put down any German forces in the region, Japanese and British troops take Tsingtao Fortress which houses the German East Asia Squadron's headquarters. German-leased territories in China's Shandong Province are also taken, as are the Marianas, Caroline, and Marshall Islands in the Pacific, all of which are part of German New Guinea. Japan also dispatches a naval fleet to the Mediterranean in order to aid allied shipping against German U-boat attacks (the Anglo-Japanese Alliance ends in 1923, after Japan has grown disillusioned with Western cooperation and instead pursues a nationalist policy). The Sam-il Movement in Korea embodies a growing resistance to Japanese occupation there. On 1 March 1919, a group of activists read a Korean declaration of independence before signing it and sending a copy to the governor-general. The movement's leaders subsequently hand themselves in to the police, but a student reads the declaration in public. Mass demonstrations follow, increasing in size until a panicked Japanese military uses force to resolve things. Massacres and various atrocities follow, resulting in thousands of dead and injured. In the same year, following the signing of the Treaty of Versailles, China's youth are shocked to find that the former German colonial territory in China is now to form part of a Japanese territory. They regard this with a sense of outrage. On 4 May 1919, using their newfound rights to freedom of speech, a huge student demonstration is organised in the capital. A force of 40,000 Czech soldiers which has fought its way across Siberia following the collapse of the Russian empire is finally extracted by a joint American-Japanese bridgehead established at Vladivostok. Son. Shōwa era. Renounced Sun Line divinity 1947. Died of cancer. The Second Sino-Japanese War is triggered when Japan launches a full-scale invasion of China, inadvertently saving the nascent communist movement from utter obscurity and extinction. That December, in a six-week reign of terror, the Japanese army massacres more than 250,000 people in Nanjing. In distant Yan'an, the defeated communist guerrilla army now finds itself part of a liberation struggle. One of the most fervent leaders of the movement, Mao Zedong, has gained power over the party and has emerged as a formidable and ruthless revolutionary. A 'United Front' is formed with the nationalists under Chinese Prime Minister Chiang Kai-shek and the communists under Mao, fighting the common enemy - Japan. Following the Japanese attack on Pearl Harbour, Costa Rica, Cuba, El Salvador, Guatemala, Honduras, Nicaragua, Panama, the Philippines, Puerto Rico, and the USA join the war on the allied side, initially against Japan, but Germany is soon included. Almost at the same time as the attack on Pearl Harbour, Japanese forces land in Siam's territory. Initial Siamese resistance is brief, and following negotiations, the Japanese forces are allowed to advance towards the British-controlled Malay peninsula, Singapore, and Burma. Peru becomes the first South American country to join the war on the side of the allies, while Mexico does the same in June. Brazil joins in August. Prior to the outbreak of the Second World War, Britain had been openly supplying China in its fight against Japanese occupation. Now Japan launches its own operation to capture Burma, using its puppet formation, the 'Burma Independence Army' which includes founding recruit Aung San. The Japanese military invasion is launched in January 1942, and the country is captured from the low-key British forces by the spring. Bolivia joins the war on the side of the allies in April, while Colombia joins in July. Japan's own war efforts are now starting to face difficulties as the USA ramps up its attacks in the Pacific. The year starts with a successful Japanese evacuation of Guadalcanal but as it progresses, the losses in Pacific territory mount up. In February, Ecuador, Paraguay, and Uruguay belatedly join the war on the side of the allies, while in March Argentina joins, followed by Chile in April. On the ground, Japan is forced out of southern Burma by a joint British-Burmese uprising. On 6 August, an atom bomb is dropped on the city of Hiroshima by the US bomber, 'Enola Gay'. A further bomb dropped on Nagasaki on 9 August brings a declaration of surrender from Japan on 2 September. Japan also surrenders its empire, including territory in China and Korea. USA occupies the main Japanese islands, with a presence being maintained by American troops until 1952. The US enforces a new constitution on the country, one which prohibits it from possessing an overt military force or engaging in warfare. Most of Japan's cities have suffered heavy damage to enemy bombers, and food shortages continue for some years, but Japan is still able to establish itself as a global economic and political power during this period. Japan joins the United Nations in 1956, while the Olympic Games are held in Tokyo in 1964. The Japanese prime minister visits China in 1972 and normal diplomatic relations are resumed. Japan subsequently closes its embassy in Taiwan, signalling to the republican Chinese the fact that their claim to sovereignty has lost another supporter. Okinawa is returned to Japanese sovereignty, but the USA retains bases there. Son. Heisei era. 125th Emperor of the Sun Line. Abdicated. Two disasters hit Japan in the same year, the first being an earthquake in central Japan in January. It kills thousands and causes widespread damage. The city of Kobe is hardest hit. In March a religious sect known as Aum Shinrikyo releases the deadly sarin nerve gas on the Tokyo underground railway system. Twelve people are killed and thousands are injured. An Anglo-American-led Second Gulf War leads to the collapse of Hussein's regime after just twenty-one days of fighting. Hussein is eventually captured, after having been located in an underground bunker (more of a deep fox hole). For the first time since the Second World War, Japanese non-combat soldiers are included in the allied forces. In the same year in which they return home - 2006 - Japan's parliament approves the country's first post-war defence ministry. In March one of the greatest recorded earthquakes takes place offshore and this - followed by a tsunami - devastates Japan's north-eastern coast. Damage to the Fukushima nuclear plant causes a radiation leak that leaves extensive areas uninhabitable and contaminates food supplies. It takes until 2019 before Fukushima's outlying town residents are allowed to return home. Japan's government approves a landmark change in security policy in July 2014, paving the way for its military to fight overseas. The lower house of parliament backs bills in July 2015 which permit troops to fight overseas for the first time since the Second World War, prompting protests at home and criticism from an increasingly militaristically aggressive China. In April Akihito fulfils his stated objective of stepping down as emperor - the first incumbent to do so for almost two hundred years. Aged eighty-five, his reign has witnessed a period in which Japan has been engaged in no warfare at all, earning his era the title of 'Heisei', meaning 'achieving peace'. Son. Reiwa era. Born 23 Feb 1960.